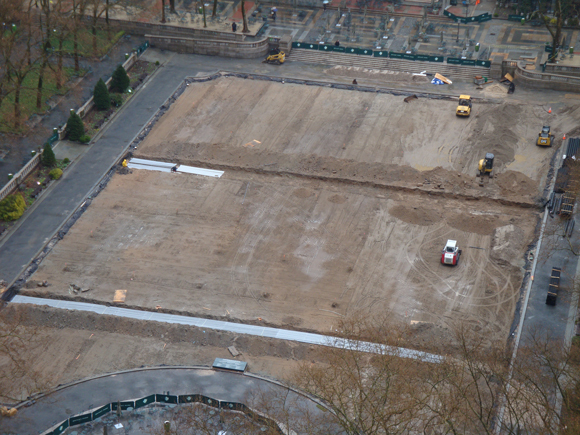 It may be raining out there, but the park's capital crews and contractors are still working away on our dear lawn. The "contaminated" layer of soil has been removed and will be replaced next week with fresh soil in which the sod will establish its roots. Currently, trenches are being carved out for drainage as well as new power lines that will run across the park (more information on the complete power project soon). In these photos, you can see the gray conduits that are in the process of being installed for the power lines. 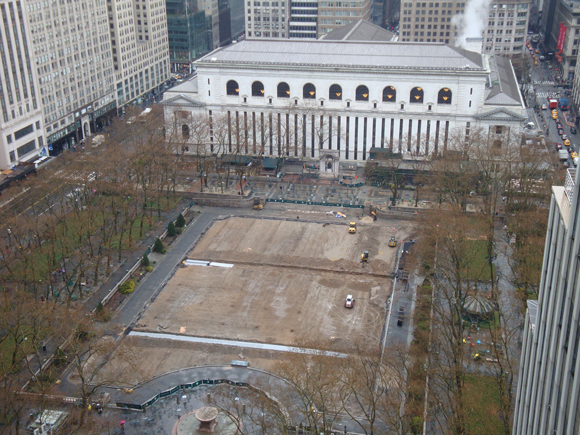 You may be following the lawn prep progress here on the blog or watching it go on in the park, but here's something you may not know: all our lawn work must be done with precise measurements and the utmost attention to detail in order to avoid impacting the roof of the New York Public Library stacks that live below the lawn.